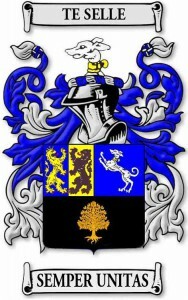 Does the Te Selle family have a family coat of arms? Often I had to answer this question in my visits to the United States. The answer is very simple: No! There has never been a coat of arms used by our family . Not surprising when you realize that our ancestors were simple farmers, who had to keep the nose to the grindstone at their tenant farms to keep the heads above water. There were no noblemen among our ancestors, not even any simple knights. Therefore, no coats of arms, armor, waving banners etc. at the Te Selle households. Probably some Te Selles did have big strong horses for heavy work on the land, perhaps similar to those large steeds in the Middle Ages onto which an armored medieval knight could be hoisted. Heraldry was a product of medieval warfare. At that time the colorful coats of arms were the latest invention in military technology. Undoubtedly in those days the distribution and display of family colors was followed with as much attention as the development of rockets, space stations, and drones is followed today. However, from a military point of view, heraldry was soon considered outdated and worthless. Nevertheless, heraldry is one of those curiosities of history that has outlasted its functional usefulness, and yet the colorful family coats of arms can still play a symbolic, emotional role in our modern times. There has always been an aura of mystery around the metaphorical language of heraldry and the related coats of arms. In the big city library of Amsterdam I loved to open old books with illustrations of coats of arms and enjoy the beauty of the colors and symbols. Once discovered, I never lost my interest in heraldry. Prompted by the questions posed to me in America about the TeSelle coat of arms, I began to fantasize about the coats of arms that had intrigued me in my youth. During my professional career I studied and taught history. After my retirement, I reread my books again to refresh my memories. In addition I now had a computer, which made it easy to experiment with sketches and drawings of possible coats of arms. My interest in heraldry had clearly not disappeared, and so I revisited my youthful fantasies once again. Perhaps I had too much time on my hands? For whatever reason, I began to design a coat of arms for the Te Selle family. After much trial and error, I finally came up with the design shown above. For a complete discussion of the various elements and symbolism of the Te Selle Coat of Arms, please follow this link to Coat of Arms Description.